50 Little Homes of Hope provide comfortable accommodations for families while their children are hospitalized. They also provide the comfort of God’s word and love for all His people. Our aim is to support our China Director in opening 25 new Little Homes of Hope in 2019. Our long term goal is to see 1000 Little Homes of Hope in China in the next 10 years. Suggested Donation: $500 – $1000, or $50 monthly. CHI True Love Home is among the first of its kind in China. 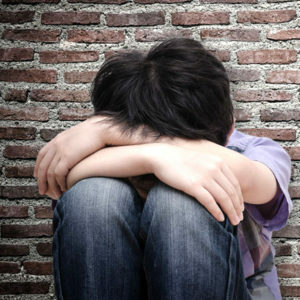 At True Love, young victims of sexual abuse receive shelter, counseling, vocational training and a sense of belonging. Without Partners in Hope, these kids would have nowhere to turn. In 2019, we hope to add ten more children and additional counselors to the group at True Love. 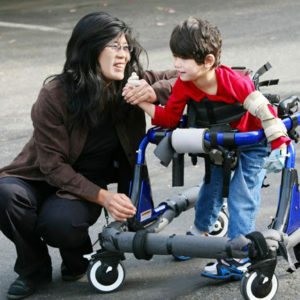 Alenah’s Home has received sufficient funds from Partners in China to to cover costs for physical therapy and medical care for children with cerebral palsy and autism. Our greatest need is for support of those who raise the funds within China. Your donation goes directly to the support of our China Director and personnel who are the driving force to make it all happen. Without them, nothing happens. 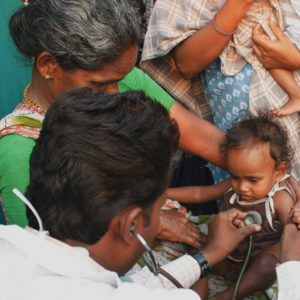 Mobile medical clinics bring doctors to villages where medical care is unavailable. Both children and parents benefit from the services provided by clinic staff. The cost for each visiting clinic is $300. Partners in Hope aims to support 300 clinic visits in 2019. Wells for clean water are another constant need in rural communities. 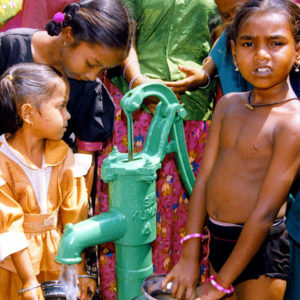 So far, Partners in Hope have funded over 250 wells in India.The current cost for a single well is $650 US. In 2019, our Partners’ goal is to fund 20 new wells in poor villages. Partners in Hope currently fund free schools in poor Indian villages where children receive uniforms, books, one meal daily and an excellent, Godly education. Your monthly gift of $19 can keep a child in school! In 2019, Partners in Hope will continue support for village schools in India. 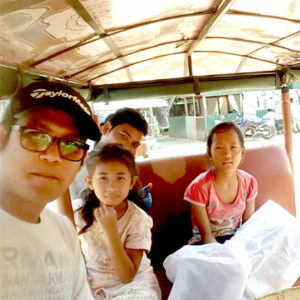 The poorest children of Cambodia are cared for through James Saan, Partners in Hope’s full-time representative in Cambodia. He brings food, hygiene and the love of God to the kids living in the sanitation dumps of Phnom Penh. In 2019, Partners in Hope will expand this vital ministry for more children. Hope Community Services gives visionary leadership in the education of girls, reclaiming the lives of young men overcome in addiction and the strengthening of Christian outreach through the translation, printing and distribution of the Bible and spiritual training. 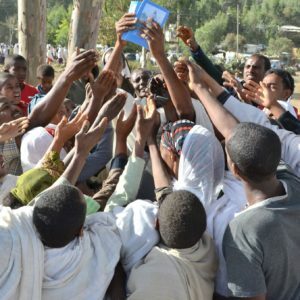 Above is one pocket of 1000’s of people crushing in on young men distributing the first copies of the Gospel of John. Keeping Hope Alive – Greatest Need is the heart and movement of all the needs mentioned on this page. It is the “Wherever Needed Most” arrow shot into the heart of the greatest need. Your automatic monthly or one time donation will be the sustaining force to see that no need goes unmet – KEEP HOPE ALIVE! MAY GOD GREATLY BLESS YOU AND YOUR FAMILY WITH HIS JOY AND PEACE. Donations to Children’s Hope Where Most Needed fund provide not only essentials and life-saving care, but resources necessary to accomplish our mission – including personnel, materials, buildings, and equipment. 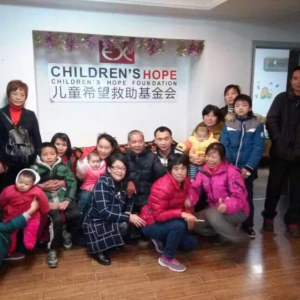 Your tax-deductible donation is stewarded by Children’s Hope to provide for needy and vulnerable children in China, India, Cambodia, Ethiopia and other as the need is seen. If funds are designated to a project that has already received full funding or is no longer available, those funds will be used for the greatest need in another program.